Till now we have seen only designing part of app. Now lets write some code. We will write code for event on button click and display some message. 3. Select minimum sdk API 14. 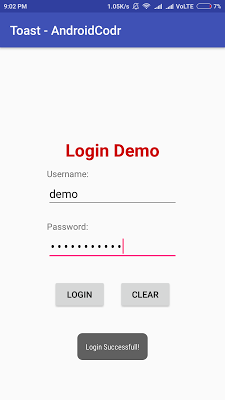 We will create simple login demo that will accept username and password from user and will check if its correct on button click. 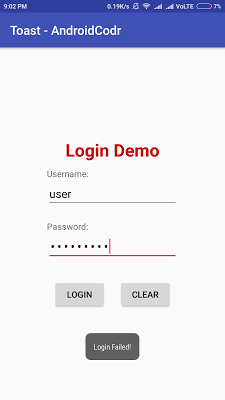 If correct Login successful message will be shown to user. Add gravity:center to our root view. Here root view is RelativeLayout. 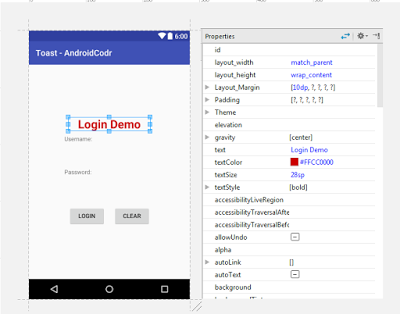 If you are using newer version of android studio you may see constraintLayout. Just replace it with RelativeLayout. While setting text size sp is used instead dp. this is good habit to give id as above to avoid confusion if you have lost of activity and more contents. First part is name of activity second part is type of content third part is id/name given. 9. 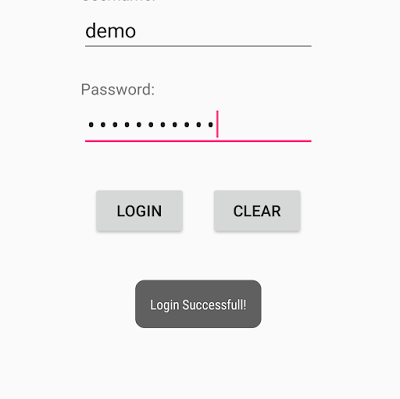 Add edittext to get input from user as password. Here weight is used for how much space it will use in parent layout. Both button weight given as 1 means they will share space in equal proportion. 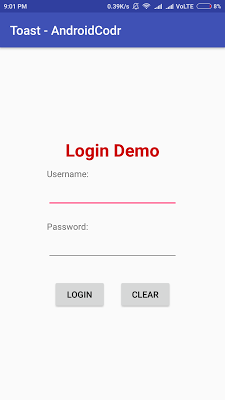 means login method will be called when user click login button. 11. Set text of Second button as Clear. We will not specify onclick method for clear button here. We will do it programmatically. Our activity is now ready Now add some code to java file. 12. You can find this MainActivity.java under java/our package path. At top package name is present. This identify location of java file. 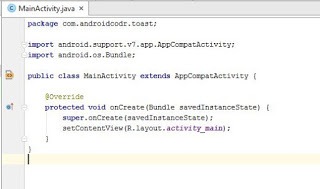 AppCompat is Support libray used by android studio by default to support old API. activity_main is set visible here. Here R.java class is automatically generated and it stores unique id for each resource used in app. 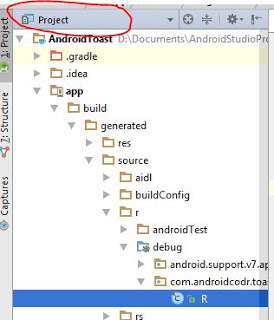 check directly from Android studio. 16. Now define onclick method login after onCreate method is completed. Here is its structure. It will get View from which it is called. 17. its simple getText method get text from edittext use toString to convert it to string and store it in local variable . 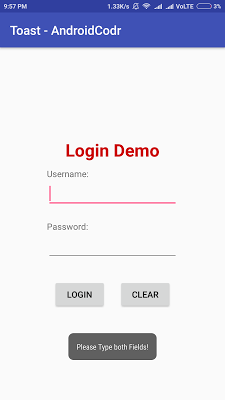 19. if both are correct then we will display a message to user Login successful. We will use Toast to display message. Here maketext method is called from Toast class to display message. Third is Time duration. Toast.LENGTH_SHORT means it will display for short duration. Call show(); method to show your Toast message. As new programmer you may forget to call show(); then it will not display Toast message. And you will wonder what’s wrong with my code. No error No Warning still not displaying message. 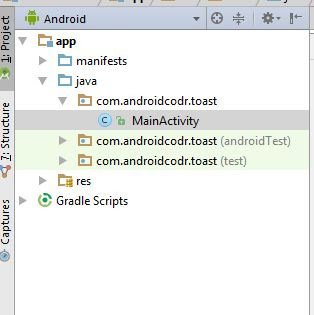 You can see create a toast just press enter and your method is added. 21. Compile and run app on emulator. A Toast message will displayed as Login Successful! 22. Try with different username Change username to user or anything you want. Toast message will be displayed as Login Failed! 23. Wait we have not added method to clear button. Lets write code for it. As I said earlier we have not added onClick properties for clear button in our activity_main.xml. inside onClick method just add these 2 lines. simple we have set text to blank to both edittext username and password. 25. Build and Run app again. Yes now clear button is also working. 26. We further added more code to check blank input from user by checking String isEmpty method from String class or you can check its length. If its greater than 0 then proceed else display Toast message Please type both fields. if you face any problem comment below. share this tutorial with your friends.